These unisex protective pull up underwear for adults provide moderate to heavy absorbency, with a 4/8 absorption level. Sold by the pack in multiple sizes, you can easily choose the adult pull-up that fits best by selecting the size that offers a compatible waist size, from 34" to 66". 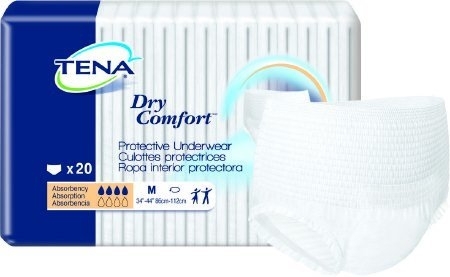 TENA Dry Comfort Protective Underwear are designed with soft, cloth-like, breathable materials that give them the look, feel and comfort of regular underwear. The soft waist elastics provide a comfortable yet secure fit, while the super absorbent polymers lock away both the moisture and the odor and ensure effective leak protection. The Target Acquisition Zone keeps the skin dry by wicking away the moisture into the absorbent core. In addition, this underwear is equipped with convenient tear-away sides to make changes fast and easy, while the snug, body-close fit makes them discreet and helps minimize leakages.